Heavy Duty design geared towards Professional Flatbed Drivers & Heavy Equipment haulers. Holds 3300 lbs. Chromate coated steel ratchet buckle with 7.5″ long handle. Knurled aluminum grip. Chromate coated steel wire hooks for greater flexibility in anchoring point selection. 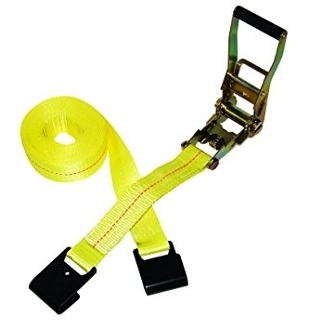 Latex coated 2″ heavy duty polyester webbing with working load printed on both ends.